SALAR Media Group | The Hemp Industry Booms in the U.S.
SALAR Media Group / Hemp / The Hemp Industry Booms in the U.S.
Hemp isn’t just for hippies anymore. Companies are spending more resources to keep up with the growing demand for the crop — which has been recognized for how it helps a variety of products, including clothing, biodegradable plastic, food and building materials. Many people still confuse hemp with marijuana. Both are strains of the plant Cannabis satvia, but hemp won’t get a person high — because it has such a low count of tetrahydrocannabinol, or THC, the chemical that alters brain functions. Hemp also has a high level of cannabidiol, an anti-psychoactive chemical that actually blocks a high. Since hemp still contains THC, the U.S. federal government classified it as an illegal drug — and, until recently, was illegal to grow in the states. 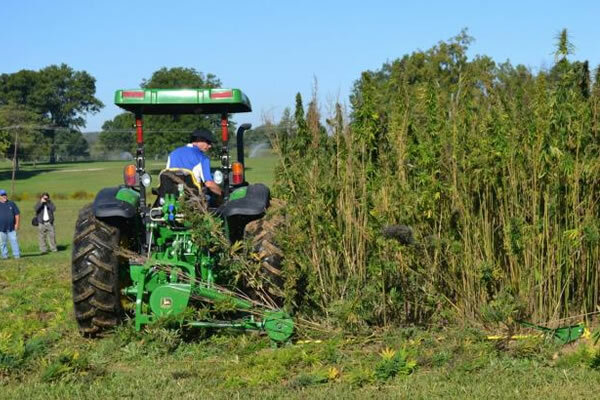 It wasn’t until the feds passed the 2014 Farm Bill that states were allowed to certify and register universities and state departments to grow industrial hemp for research purposes. The federal bill gives each state the right to determine whether or not farmers can legally grow commercial hemp. So far, 22 states allow farmers to grow industrial hemp and seven states, including New York, allow research-related programs for the crop. In January, the Industrial Hemp Farming Act of 2015 was introduced to the U.S. Senate and hopes to separate industrial hemp from the definition of marijuana. But it is still waiting for a vote. Hemp has deep roots in the world’s history. Being used as early as 10,000 B.C. in China, hemp was a popular crop because it made paper, rigging for ships and clothing. Even George Washington farmed hemp in Mount Vernon. During World War II, the U.S. government turned to domestic hemp to create war goods when Japan cut off supplies. But soon after the war, the government started its campaign against marijuana, and much of the hemp history and growing techniques vanished from the U.S. culture, Eric Steenstra, executive director of Hemp Industries Association, told the Daily News. “The knowledge on how to grow hemp was lost,” Steenstra said. Hemp fiber is one of the most durable natural materials found around the world. Hemp is a good textile for making clothing that feels good and soft like linen — but also durable, said Robert Jungmann, the founder of the hemp clothing line Jungmaven. “Hemp is a natural resource that grows fast. (Deciding to use it) was like a big lightbulb,” Jungmann said. Although hemp clothing can be more expensive than cotton, Jungmann said, the clothing lasts years and is an investment that pays off. Also, wearing hemp benefits the skin since it discourages growth of bad bacteria, Jungmann said. Hemp is a hardy crop that requires no irrigation, no pesticides or synthetic fertilizers, and is harvested and processed by hand, said Adam Fetcher, spokesman for the clothing company Patagonia. The low-impact plant also absorbs a substantial amount of carbon dioxide and returns it to the soil, Jungmann said. Americans purchased an estimated $620 million of hemp products in 2014, Steenstra said. All of the hemp used in these products was imported from other countries even if the product was made in the U.S. Most of these imports were from China — the leading grower of hemp — Europe and Canada, Steenstra said. The hemp industry will take time to grow and is a long-term venture for a lot of companies, Steenstra said. “People are making an investment in this to get the industry growing,” Steenstra said. Some argue that the industry will help to create jobs and improve the troubled farming industry in the states. “It’s really going to be tremendous for all of America, not just farmers,” Colorado hemp farmer Ryan Loflin said.